DO YOU KNOW ABOUT DND? DND means Do Not Disturb. It is a new policy that bars people from receiving bulk sms messages except they take some actions. This applies to all network. You text HELP to 2442 to get all DND options. But for MTN users, In other to receive BULK SMS, the best way is first Text STOP to 2442, after you receive confirmation that you have activated DND, send ALLOW to 2442. DND don't affect corporate route users. IPWEBSMS offers uniqueness in SMS Delivery. 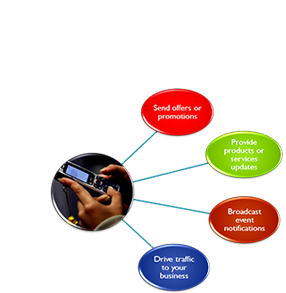 We give everyone the opportunity to explore opportunities as Nigeria's leading BULK SMS Gateway. We have no hidden charges and we don't promise what we wont deliver. Our platform is built on the basis of integrity. Please always test your message before sending bulk. Some sender id's are forbidden. Our sms platform offers the most unique features in sms technology. To corporate organizations and institutions, we are a platform to reach out. To individuals, we are a friend that keeps you connected. To SMS portals, we are partners in business. Expanding your reach is all that matters at IPWEBSMS. You can market instantly and directly to your customers or group members, or alert them of offers, deals, meeting or change in arrangement. The mobile marketing just got better with ipwebsms.